As a therapist myself, I have seen, first hand, how hard a new marriage can be on kids. 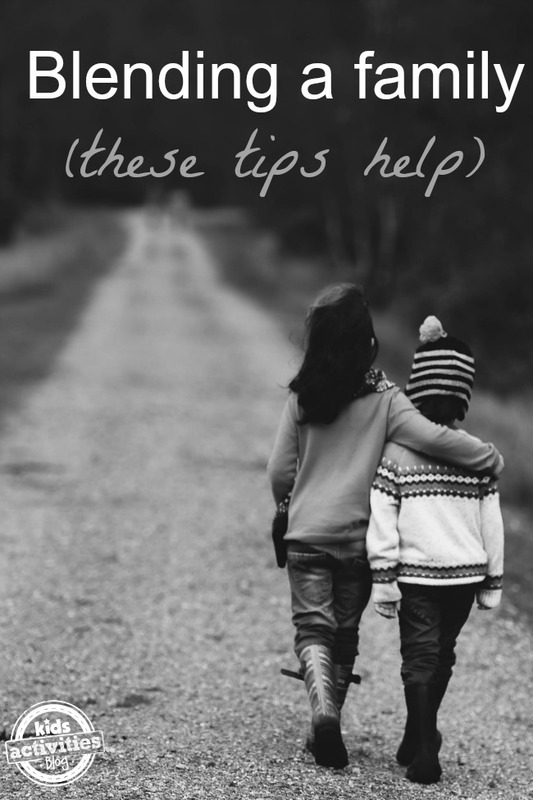 A blended family can cause stress on the kids, so today I want to share some advice on how to blend families more easily to make it easier on the kids. Remember, It will take time. Realize you will need to give the relationship time to grow. Do not force it, but give it time to grow as you get to know each other. Let your kids get to know you and your kids. Kids are resilient, but they are also not magicians. They need time and space, but also love. Speaking of space, remember that many kids grieve the loss of normalcy as their parent marries someone new. They will need space to adjust to the new normal. That’s ok. Remember to just LOVE THEM. Love your new step-children. It is easy to love our own kids and hard to accept the quirks of new kids, but love them anyways. Accept them for all that they are and encourage your new spouse to do the same. It is important to create a family atmosphere. Put pictures of all the kids in the home, speak to your husband about “our kids” not “your kids”. Put pictures up of everyone together. Try to build family rules/expectations together. Now may be a good time to sit down and have a little family pow-wow. Talk about what is expected and consequences so everything is out in the open. Let everyone have a say in it. Make these rules and expectations together, as a family. Be sure to cheer them on. What are your step-kids into? Find simple ways to encourage them in these hobbies. Show interest in what interests them. Go to their sporting events, join in on their hobbies. Whatever it is, be a part of their world. While you are learning their new hobbies, teach them, too. Take time to teach them and show them what you love to do. Just like you would with your biological children, take time to sit down and train the kids. Kids learn so quickly and are like little sponges. A great way to make things run smoother is to work together to create new traditions. As a new family, build in new family traditions. Could you start pizza nights on Fridays? Ice cream sundaes? Family game night? Whatever it is, everyone joins in and it is a tradition. STICK TO IT. Most importantly, just be there for them. Listen to them cry, comfort them, help them when they are sick. The little moments of being present will mean the world. You need to remind them you are not there to replace their mom, but you will love them like a mother loves her children. Be kind to their mom and tell them how fun it is that they get to have two moms! Talk to them about their mom, in a positive light so they can see that you aren’t out to replace her, but simply to love them. What tips would you add? Find more helpful tips on our Facebook page.